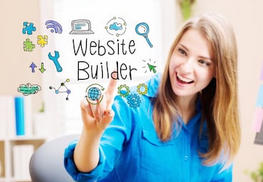 Website builders are tools that allow you to create a website without manual code editing. For people who have little to no experience of creating a site, website builders offer business owners a low-cost option to create their own professional looking website. While there are many website builders in the market, only the best can give you a high-quality, fully functional website that includes mobile-friendly practices, social media integration, updated e-commerce tools, and more. Among all the website builders featured here, Weebly is the most user-friendly of them all. In fact, designing your website can be as easy as making a PowerPoint presentation. This website builder has a wide array of professional business templates that are fully customizable. With just a few clicks, you can easily change the text and the photos. Weebly also supports features such as blogging, e-commerce, and web forms. If you’re looking to create a more interactive website for placing food orders, tracking packages, booking appointments, and the like, check out WordPress. WordPress may be the most popular website builder here since they’ve been around for quite some time. They have a team of developers that are constantly trying out new features. Similar to Joomla, WordPress is flexible. Which means you can use it to create any kind of website. If you’re more particular with ease of use, Squarespace is the one for you. Their templates are geared towards a more minimalist style with a good amount of open spaces where business owners can show off their portfolio. Squarespace has more than 90 templates to choose from and around 100 official integrations. Are you in the retail industry? Shopify is made for physical store owners who want to sell their goods online. It offers a POS system to keep track of in-store sales, as well as an e-commerce website builder for online sales. When you combine these two, both your sales report and inventory are coordinated. This makes it easier for you and your customers since they can return items and/or use gift cards online or offline. Just like Weebly and Squarespace, Wix is easy to use since it has a drag-and-drop editor. The only difference is that you can actually place the elements anywhere. This is perfect for business owners who would love to unleash their creative freedom when designing their website. However, this freedom comes with a price; specifically slower loading times and a higher price. Similar to WordPress, Joomla is a free open-source content management platform. However, it’s not as user-friendly as WordPress since it caters to web design pros. This is perfect for advanced, interactive, social websites where visitors can log-in and interact with your content. Aside from creating a website, what else does your business need to succeed? SMB Compass’ mission is to help small businesses reach their full potential. If you want to know more on how to successfully run your business, give them a call at (646) 569-9496 or visit them online at smbcompass.com.